Welcome to PeopleDoc's Product Blog! Click here to view previous posts. At PeopleDoc, we have several guiding principles that we follow in order to deliver the products you know and love. These help us keep things in check; for example we won’t sacrifice ease-of-use when we deliver you technically advanced features. In the April release, we focused on two of our guiding principles: Building Globally and HR Agility. This is in addition to the 11 languages already offered. These additional languages give your HR users and your employees a better experience. We’ll continue to roll out new languages and will keep you posted on the progress! Watch a process - When you are waiting for an action to be completed in a process by another person, you can now view the process in a new tab called “Watching.” “Action Required” means you can now complete a task. This helps you track processes better and stay on top of your current and future action items. Send a reminder - People are forgetful. We know it’s important for you to be able to remind employees to complete a task. Now, you have the option to manually send a reminder to employees to complete a task with the simple click of a button. Tree view - Sometimes it’s easier to look at a process in a more graphical way to follow the flow of events. 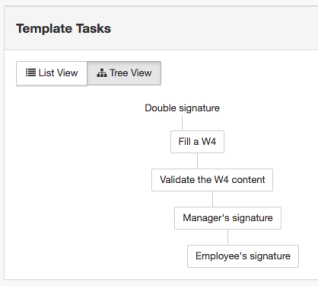 You can still view a process template in a list, but now there is an additional option for admins to view a process template as a tree so you can follow the logic in another way.